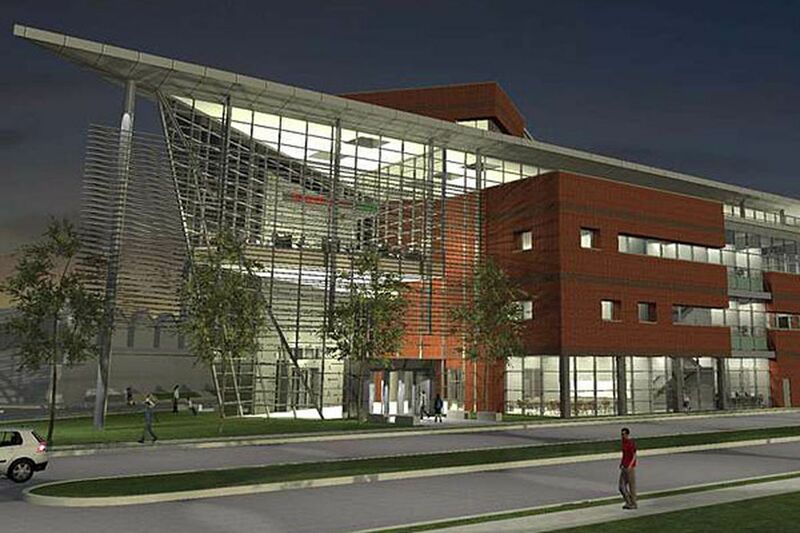 An artist's rendering of La Salle University's new multitiered, 78,000-square-foot business school. PHILADELPHIA La Salle University plans to build a $35 million, 78,000-square-foot, multitiered business school that will be wireless and allow students to interact with executives around the world 24 hours a day, officials said Tuesday. La Salle is the latest local university to announce a major upgrade to its business program in recent months, in what has become an arms race for the newest and best on Philadelphia campuses. Because of the steep competition, the university has chosen to pay for the building with $20 million from a 2012 bond issue and $15 million in alumni donations - 57 percent of which have been secured. The building is scheduled to open in January 2016. Drexel University last month opened its $92 million Gerri C. LeBow Hall, a 12-story, 177,500-square-foot building with an exterior of limestone and glass. Also last month, Villanova University announced a $50 million gift earmarked to its business school for new internships, scholarships, study-abroad experiences, mentorships, and technology upgrades. And St. Joseph's University is looking to add a 40,000- to 50,000-square-foot addition to Mandeville Hall, which opened in 1999. It will be separately named and contain classrooms, "team rooms" where classes work collaboratively, a Wall Street trading room, and some speciality facilities for the school's centers and institutes, said Joseph DiAngelo, dean of St. Joseph's Haub School of Business. Haub's enrollment has doubled to 3,700 undergraduate and graduate students and has outgrown the 95,000-square-foot building, he said. "This is a tough market for anything in education," McGinniss said. "There are a lot of schools, and there are a lot of good schools. . . . We just thought it was a good time to assert our place in the market again." DiAngelo agreed, noting that there are more than 80 colleges within 25 miles of Philadelphia. "The competition in Philadelphia is immense. So you are constantly looking for the newest and the best, because that's what the market is looking for," said DiAngelo, former chairman of the national Association to Advance Collegiate Schools of Business. "Parents will say, 'Why does college cost so much?' and then they'll say, 'Well, somebody else has a new building.' This is what you have to do to stay on top of things." The association, which has about 650 U.S. members, is aware of 56 universities across the country that are involved in building or significantly upgrading their business schools, said Dan LeClair, chief operating officer. Such investment, he said, has remained consistent over the years at business schools - generally a major revenue generator on college campuses. "Definitely, schools are trying to make their space aligned very much with what makes them distinctive," LeClair said. "Business schools are really thinking deeply about what they're trying to achieve and their purpose in the communities they serve." Over the last 15 years, many other local universities with business schools, such as Temple, Widener, and Pennsylvania, have erected buildings or made other major investments. La Salle has 3,450 full-time undergraduate students and roughly one of every four is in the business school, making it a major part of the educational mission, McGinniss said. More than 500 graduate students also are enrolled. Enrollment, he said, has been increasing steadily. Total enrollment is 6,450. La Salle's new building will be at Wister and Chew Avenues on its main campus. Still subject to zoning approvals, it would extend La Salle's front from Olney to Chew Avenues, near where the university opened a new school of nursing and health science building in 2008. The building will include a 300-seat auditorium, a corporate-style boardroom, a sales training laboratory, computer rooms, simulation labs, and a large atrium for social events. On a triangular plot, the building will include a lot of glass, which McGinniss said is meant to indicate a "two-way openness" to the surrounding community, in addition to providing natural light. Classrooms, gathering areas, and faculty offices will be close to foster interaction and mentoring, McGinniss said. When ready, it will replace the business school's home in College Hall, which offered a prime location but has thick walls that make wiring and technology difficult to install, McGinniss said. College Hall will be revamped for other uses, he said. The university may offer naming rights, McGinniss said, but said that was premature to discuss. The college also plans a major advertising campaign for its business school, he added. He said he expected to have pledges for the rest of the alumni donations for the building by May, when he is scheduled to retire from the presidency. La Salle was in line to get $12 million in state funding for the new business school, but McGinniss said the university is not counting on that money, given the financial pressures on the state. Correction: Earlier version of this story incorrectly reported that the university would use endownment funds to help pay for the new building.